Just steps from the historic, charming Riverwalk, this Wyndham Garden San Antonio Riverwalk/Museum Reach is perfect for leisure travelers and business travelers alike. 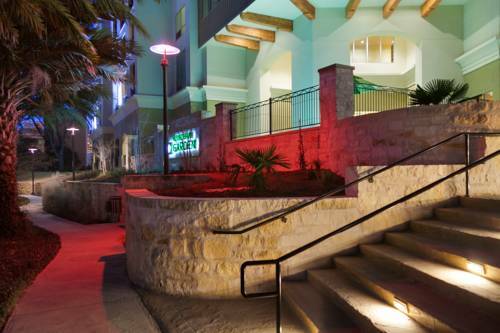 This smoke-free hotel offers easy access to restaurants, museums, downtown San Antonio, the Alamo and Market Square, and is convenient to Air Force bases, Fort Sam Houston and the San Antonio International Airport. For your convenience, pets are welcome, and there is complimentary wireless Internet throughout the hotel. Work out in the state-of-the-art fitness center, splash in the sparkling outdoor pool with river views and enjoy a cocktail on the patio. Two in-house restaurants serve all meals and room service. Three versatile meeting rooms accommodate up to 200 people, ideal for smaller gatherings, and the hotel offers catering and event planners. The spacious guest rooms feature 37 inch flat-screen TV, MP3 dock, Mini Bar and Wolfgang Puck coffee. Select rooms are available with balcony and separate living area.